He was so simple that it is difficult to write about him in an extraordinary manner. He spoke of watermelons and how the young generation, bereft of right education, is ruining the future of the nation (Hint: Full story at the end). He passed out of IIT-Mumbai, but was so unassuming he looked more like a village boy who was too straight-forward and frank to be a politician. He feared no one except his conscience and god. For him the comforts of Delhi were absolutely immaterial -- he loved his Goan fish curry and non-veg food and was delighted to share when my wife specially prepared a few things for him and sent it to his Delhi's Akbar Road bungalow. His breakfast was the simplest on Earth and one shared with all his staff who would sit with him at his table while he went through the daily newspapers. His nights were almost never-ending, and so was the completion of file work. He was often angry and frustrated at the snail's pace at which defence ministry babus worked. He tried his best to have some speed injected into it. "It is all a colonial legacy, we have not been able to get rid of babudom," he would lament. His decision-making was at lightening speed -- yes meant yes and to be implemented immediately. And no meant no further discussion. One has to be very strong from within, like steel, to have a persona like him. As editor of Panchjanya I was invited to speak on World Press Day in Goa by the state government, where Parrikar was the chief guest. I tried to dress properly -- in a light bandhgala -- and had a well prepared speech. This was about two decades ago. So we waited for the chief minister to arrive. Suddenly, the state information secretary asked meto come to the dais as CM sahib was already there. I looked around -- no one looked like a typical Indian political heavyweight -- and was shocked to be introduced to a gentleman who was dressed in a casual shirt, pants and chappals! I was visibly embarrassed and said meekly when the programme began, "I am sorry, I got ready for the event like a CM and Manoharji has arrived like a genuine journalist!" The audience laughed and Parrikar's laughter was the loudest.His friends -- a few in Goa and in Mumbai -- from RSS circles and also from out of it simply called him Manohar. He was as normal and a person in a crowd as anyone else. 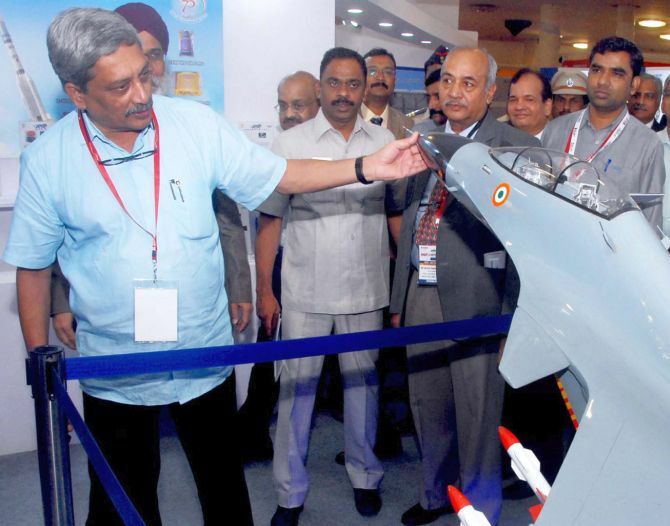 His best he gave to Goa and the defence ministry. It was difficult to persuade him to wear a bandhgala for the Republic Day parade and for the formal inspection of military parades. He would come to office in his simple attire and finish all the work. He was responsible for pursuing the announcement and implementation of OROP. The post-Uri surgical strike and the Rafale deal showed his best attacking form while putting the Congress in the dock. He was guiding BJP leaders to ensure that Narendra Damodardas Modi was chosen as the party's prime ministerial candidate at the 2013 BJP national executive meeting. Too many undercurrents concerned him and he said to me in the hotel lobby where the meeting was going on, "These people don't understand if we don't choose Narendrabhai, there is no future for the party." For Narendrabhai, Goa always proved historical -- in 2002 also, it was the Goa national executive meet that resurrected him and put the strong opposition within to rest. Parrikar was absolutely sure of supporting Modi in the interest of the nation's greater good, and Modi recognised that. It was only the persuasive power of his close friend Modi that made Parrikar come to Delhi in spite of his initial hesitation, for Modi wanted a strong man, and a man of the highest integrity, to head the Raksha Mantralaya. Manohar's only weakness was good pens, and he had a large collection of world-famous pens in his cupboard. It was easy to greet him on his birthday even if you did not carry a bunch of flowers. Why bring flowers, just come and have sweets with me, he would say. Every time I met him, and during his tenure, the Raksha Mantralaya was always open to me. I felt like listening to a new raga, with new excitement. He had that aura. Once I saw him at Jaipur airport, when he was returning after attending a defence meet and I was coming back from an RSS programme. He was standing in the queue to board the plane --- just one of many passengers. "Manoharji, tumhi hey line madhe kashala? (How come you are standing in line? )," I said to him in Marathi, "when you could have come later like a 'normal VIP'." He saw the lighter side of my sentence and laughed. I took his picture and that went viral on social media. In Uttarakhand, soldiers' organisations have been demanding a war memorial for more than three decades. Everyone, every party, okayed it, but things never moved an inch. I gave Rs 2.5 crores for it from my member of Parliament local area development funds. The MoD was slow and indecisive, rather unenthusiastic as ever, so I had no choice but to approach Manoharji. He saw all the material, discussed it and said, "Chalo, karte hain." Orders were issued, the date was given, communication was released -- August 20, 2015. Still, some file work was left unfinished, and he was not happy to change the date, but said, "Dekho, ab theek nahin kiya toh baad mein tumko takleef karenge (if we don't do it correctly now they will trouble you later), let's finish with what they (MoD file work babus) want." Finally, on April 30, 2016, he came to lay the foundation stone of Uttarakhand's first-ever war memorial in the public domain -- overcoming many a hurdle and throwing political issues to the shredder. However, the inauguration of this war memorial, of which he became the founder patron, is still awaited. He tamed death and lived like a warrior king. Last September, when I saw him at AIIMS, doctors were shocked to see his willpower -- he wouldn't have served this long unless he had something very strong in him -- the power to live. He defeated death with his struggle and power to realise his dream project -- the Mandovi bridge that his closest friend Nitin Gadkari made possible -- to be finished in record time. He bid his final adieu peacefully after that. Goa will be never be the same again. He walked on Mandovi's waters as a warrior monk, a son in the lap of his mother. I am from the village of Parra in Goa, hence we are called Parrikars. My village is famous for its watermelons. In seven years, Parra's best watermelons were finished. Unless we employ our best to train the next generation, this is what can happen to us. We must attract the best into the teaching profession. Tarun Vijay, former BJP MP, was the chief editor of the RSS weekly, Panchjanya, for 20 years.